Jeb Bush: Clinton Was Lucky. My Brother Was Unlucky. Obama Makes Too Many Excuses. 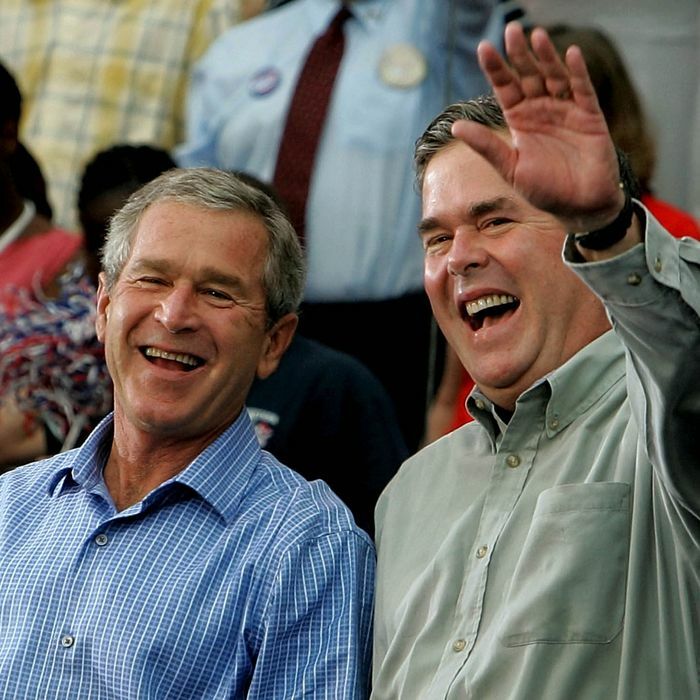 Like all of the non-Trump Republican candidates, Jeb Bush’s economic strategy is built around a program of regressive, debt-financed tax cuts, just as it was under the last Republican administration. In a very clever interview, John Harwood repeatedly asks Bush why he is pursuing this course despite its repeated failure. Bush’s attempts to respond reveal the tangle of denial, non-falsifiability, and cant that undergird the party’s unshakable commitment to voodoo economics. First of all, I think you have to factor in that policies have long-term impacts. So the tax reform of the 1980s created an environment that President Clinton took advantage of. The PAYGO budget compromise, where there was an increase in taxes, but there was more importantly, a rule that every dollar of additional spending required a cut in spending, was very effective in restraining government during the Clinton era as well. Presidents and Congress have an impact particularly on tax policy to shape economic growth or the lack of it. The results can occur for a short period of time or a long period of time. The tech bubble created enormous economic activity. You think about all the capital gains revenue that came when people were selling stocks, and so then the crash created the opposite effect. Notice that the tech bubble counts here as a reason to discount growth under Clinton and to excuse the lack of growth under Bush. But the Bush-era housing bubble under Bush does not discount growth under Bush. Instead, he lamely suggests that, after the recession that began in Bush’s first year, and before the recession that began in Bush’s last year, the economy grew in between, if you ignore the gigantic bubble that drove that growth. Let’s try that plan again! Harwood: Well, he had the— he— he— he inherited the greatest recession since the Great Depression. Bush: Yeah, we’re in year six. At what point do we say, “The dog—” stop saying, “The dog ate my homework,” and it’s someone else’s responsibility? So Bush has dismissed the entire Clinton economic expansion as the work of the person who held office two presidents before him. And he’s dismissed the entire miserable Bush-era economy as the product of a series of events — tech bubbles! terrorist attacks! — over which he had no control. But the still-going Obama economy is terrible, and any explanation that involves external events, like a worldwide financial collapse, are just poor excuses, and Bush doesn’t want to hear it. Harwood repeatedly asks Bush why, given his purported interest in inequality, he proposes “a policy that confers a huge proportion of its gains in the immediate sense on people at the top of the income scale.” Bush replies, “On personal rates, in our plan the people at the highest level, 1%, 10%, 20%, the people in the top 20%, pay proportionately more under our plan.” In fact, 53 percent of the benefit of Bush’s tax cuts would accrue to the richest one percent, who earn about 21 percent of the national income. … And there is your most honest Bush answer of the interview. Giving a huge tax break to people who have inherited an estate exceeding $10 million (the current tax-free exemption level) has so little to do with the “Right to Rise” that Bush can’t even come up with a rationale. He just explains that he thinks they should be able to keep their entire inheritance tax-free because that is his idea of fairness.